Master the components and details behind procedure codes! More than 6,000 lay descriptions, illustrations, modifier definitions, surgical terms chapter, eponyms crosswalk, and reimbursement terms. 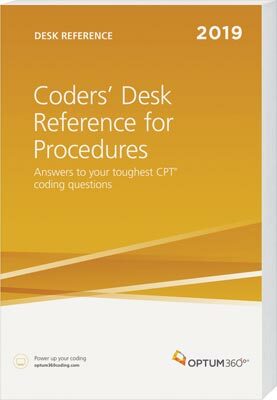 The Coders' Desk Reference for Procedures is a comprehensive resource for all 2019 CPT® codes. This all-inclusive tool helps identify the minute differences between, and components of, similar CPT® codes. You will code more accurately from operative reports and produce cleaner claims the first time by improving your understanding of the clinical meanings behind the codes and checking billing and coding information for Medicare. Plus, this reference is ideal for training new coders and medical staff in the CPT® coding system. NEW Place of Service Codes for E/M services. Review list of CMS-1500 place of service codes with grid of Evaluation and Management codes linked to the appropriate place of service. Comprehensive CPT® code listing with CPT® procedure lay descriptions. Eliminate the need for multiple resources with a one-stop resource of more than 8,000 CPT® codes and 6,000 lay descriptions for surgery, laboratory/pathology, radiology, medicine, and evaluation and management codes. E/M guidelines. Review components of care needed to determine E/M levels of service, assisting in proper E/M code assignment. Modifier definitions and usage rules. Reduce research time and improve coding accuracy with a complete modifier list, accompanied by narrative explanations to ensure proper use of modifiers. Procedure eponym crosswalk. Locate eponym definitions and code links in an alphabetically organized section. Reimbursement and procedure glossary of terms. Understand terminology often used in medical record documentation and terms used in communications with payers. Abbreviations, acronyms, symbols, prefixes, and suffixes. Better understand terms and use these valuable tools for more efficient CPT® coding. Anatomical illustrations. Recognize the body sites described in operative reports with helpful illustrations.